Soybean Hulls, Wheat Middlings, Flaxseed, Soybean Meal, Monocalcium Phosphate, Dicalcium Phosphate, Cane Molasses, Yeast Culture, Vegetable Oil, Calcium Carbonate, Salt, Magnesium Oxide, DL-Methionine, Calcium Sulfate, Potassium Chloride, Zinc Amino Acid Complex, Copper Amino Acid Complex, Manganese Amino Acid Complex, Cobalt Glucoheptonate, Copper Sulfate, Manganese Sulfate, Ferrous Sulfate, Zinc Sulfate, Calcium Iodate, Sodium Selenite, Vitamin A Acetate, Vitamin D3 Supplement, Vitamin E Supplement, Biotin, Riboflavin Supplement, Calcium Pantothenate, Niacin Supplement, Folic Acid, Choline Chloride, Vitamin B12 Supplement, Pyridoxine Hydrochloride, Thiamine Mononitrate. NuZu Feed Alpaca Omega Fiber complements good quality grass hay and pasture. 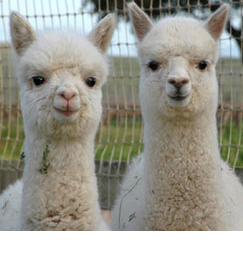 Female lactating alpaca: Feed NuZu Alpaca Omega Fiber at a rate of 1.0 to 1.25 lb/head/day. Late gestation (last month): Feed at the rate of 1 lb/day. Adult maintenance: Feed at the rate of 0.3 to 0.5 lb/day. Growing alpaca: Feed at the rate of 0.3 to 0.5 lb/50 lb bodyweight. The suggested feeding program above is intended solely as a guide. The variables of management, environment, and breed may dictate changes in the animals' requirements. This feed contains supplemental copper. Do not feed to sheep.